Investors in Japan's stock market had another rough day as cracks begin to show in Abenomics experiment. The roller coaster ride on Japanese stocks went into a third straight session Monday as exporters were hit by gains in the yen. The Nikkei index of leading Japanese shares fell by 3%, more than erasing Friday's modest gain, which came in a volatile session following the biggest single fall in two years on Thursday. On Monday, the yen gained 0.4% against the dollar to stand at 100.8 after falling to 103 last week. 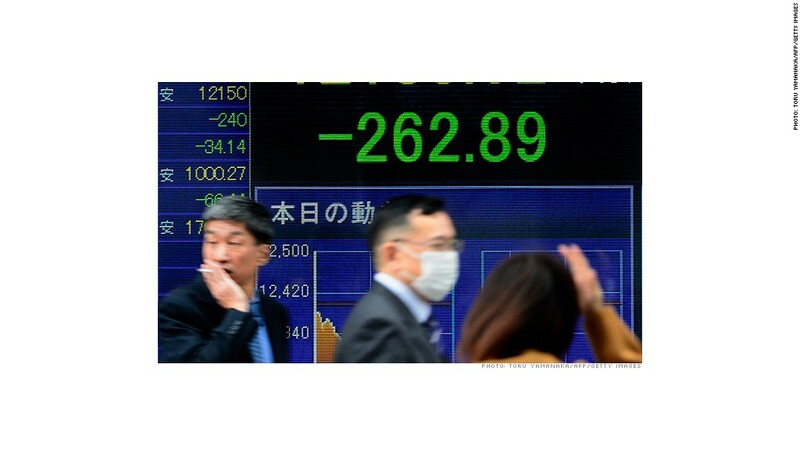 Other Asian markets were firmer and European stocks, which have lagged behind Japan and the U.S. so far this year, also gained ground on Monday. U.K. and U.S. markets were closed. An aggressive push to reflate the world's third largest economy has seen the yen fall 16% against the dollar since the start of the year, and driven the Nikkei up by 36% to 5-year highs over the same period. The Bank of Japan has pledged to pump $1.4 trillion into the economy in less than two years in an attempt to end 15 years of deflation and boost growth. The Japanese government is also borrowing more to spend on public works. Until recently, the "Abenomics" expansionary experiment appeared to be having the desired effect on financial markets, and stronger-than-expected annual GDP growth of 3.5% in the first quarter suggests it may be juicing economic activity. But Thursday's 7.3% Nikkei plunge, which was its biggest one-day decline in more than two years, has given some investors reason to question how effective the policy will be. And rising Japanese government bond yields may also spell trouble. The 10-year JGB yield stands at 0.8%, up from 0.6% a month ago and almost back to where it was this time last year. Higher yields may reflect rising inflation expectations but could hurt Japan's banks, which are big holders of government bonds, and push up the cost of servicing the country's debt mountain -- more than twice the size of its economy. Bank of Japan Governor Haruhiko Kuroda said Sunday the country's financial sector could cope with higher bond yields if they reflected an improvement in the economy because that would generate higher profits on lending. Nomura Securities said the sharp pullback on Japanese equities could prompt some foreign investors to reassess the likelihood of further gains if the Bank of Japan were unable to control bond yields for a sustained period. "Given that such a large number of investors have been optimistic on Japanese equities, it may be that in the near term some adopt a more cautious stance while keeping their attention on developments in the Japanese government bond market," its strategists said in a note Monday. Minutes from the central bank's April meeting also showed some members of its board expressed concern about the volatility in the bond market, and questioned whether the bank's ultra-easy monetary policy would achieve its inflation target.